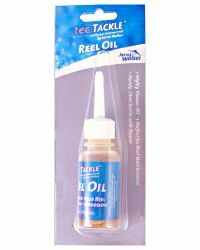 This is a highly viscous reel oil from Tec Tackle, perfect for keeping your reel operating smoothly and efficiently. A little reel oil goes a long way so use sparingly. Comes in a handy 25ml bottle with dropper nozzle. Use tec reel oil sparingly as a little goes a long way and excess oil will just run off. It's recommended that you put one or two drops of tec reel oil on reel bearings, shafts and spindles. Other working parts such as the ratchet pawl and clutch mechanism can be protected by applying a light film of the reel oil over the surface.